Notify is presenting itself as unpopular and lacking a value add component. A continued lack of monetization is frustrating as the company tries to perfect WhatsApp and Messenger. High expectations for growth could backfire on the company’s stock come future earnings seasons. 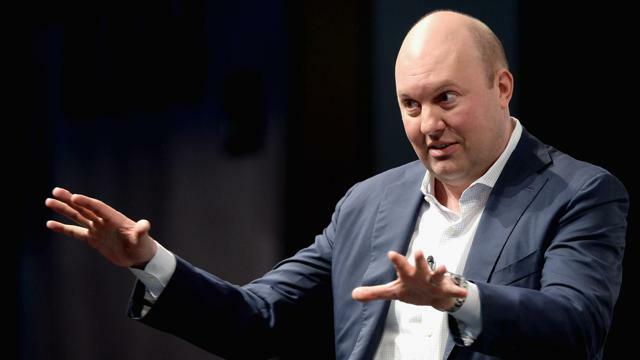 We can only speculate so far on Marc Andreessen’s recent selling of 73% of his shares in Facebook (NASDAQ:FB). If you were look at this company on January 1, 2015, you saw the stock struggling around the $80 level with no clear future direction. Had you taken a gamble and bet on the company surpassing even its own expectations, you would’ve seen the stock perform exceptionally YTD, up some 35.32%. The question is, as we move through Q4 and into 2016, are we sitting on the small plateau of another strong 10-month trend? I’d argue yes, and you can view my bullish cases here and here. However, I believe there are certain things significantly holding the company from reaching its true potential. It’s going to be difficult for the analyst community to gauge how these numbers begin to level off. The speculation will draw to a viable range, but even then the company could miss wide or surpass for a few more quarters. If the latter is the case, we’ll likely see a run up in the stock like we saw this year. 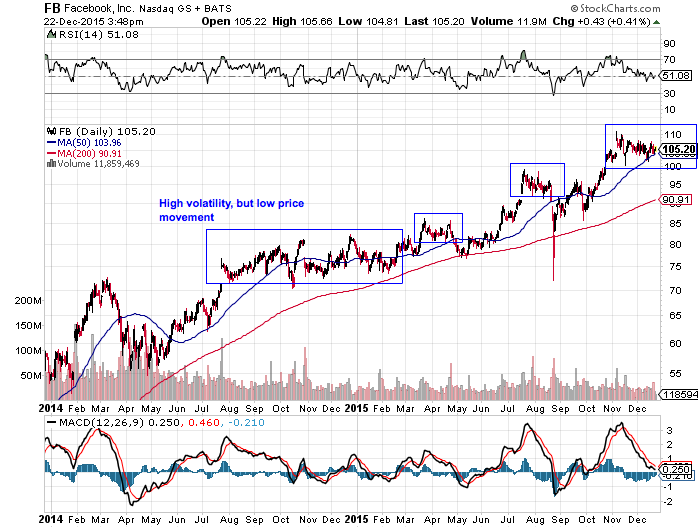 However, if we see the former, we have a situation like what’s going on at Apple (NASDAQ:AAPL). Despite the company still on track to sell tens of millions, the growth is beginning to level off. Herein lies a caveat. While the stock will retreat on decreased growth versus 2015 comps, the stock will find its fair value to be much lower. The company will face easier comps the year prior and averaging into a position at that lower level will be lucrative for the quarters following. It’s an expectation game and I believe Facebook’s numbers are beginning to top out, increasing the likelihood of earnings misses this upcoming year. As each quarter goes by, what does Facebook miss out on in terms of ad revenue from WhatsApp and Messenger? Well, let’s try and think of this in terms of what Instagram generates in revenue per year. Instagram has 400 million MAUs and climbing and is on track to do $600 million in ad revenue this year. If we scaled those to WhatsApp and Messenger, having 900 million and 700 million MAUs, respectively, the company is missing out on $1.35 billion and $1.05 billion, respectively, in annual revenue. That’s substantial and they need to recover the $20 billion price tag of WhatsApp, which has been the subject of much criticism. Additionally, Instagram is projected to increase revenue from ads by 2.5x next year to $1.5 billion. That’s a multiple that could be presently applied to both WhatsApp and Messenger, but instead Zuckerberg has made it clear that until these products are refined to the maximum, ad revenue will be on the back burner. Facebook is concerned that if they try and monetize these apps too soon while they’re still growing at a high rate that users will withdraw. If we think about the company’s game plan after the Q2 report, management stated that they wanted to “get people organically interacting with businesses before you let companies pay to reach customers.” The fact of the matter is that the timeline has to be sped up before shareholders become too dissatisfied. Monetizing these two apps is a challenge as they are text-focused applications. Thus, that’s where businesses come in and Zuckerberg’s push for Facebook to be an e-commerce one-click buy hub comes in to play. Businesses will be able to contact individual shoppers directly, send extensive messages about new products, much like an e-mail offering, but with the well-curated benefit of push notifications and more personalization. If you go onto the App Store, the 11th review on Facebook’s new news application, Notify, is “What’s the point of this app?” It’s not even in the top 150 downloaded free apps. You can see for yourself in just a quick tap or view the trend here. Ventures like this question whether or not Facebook is trying to diversify too quickly. While I’ve made it known that I like the growth potential in the diversification into the product space via the Oculus Rift, I’m not so keen on Notify. Yes, it’s a chance for the company to rival Twitter (NYSE:TWTR) and arguably diminishes Twitter’s value-add component if Facebook can re-invent the platform so quick but I don’t think this app is the next big thing Facebook is looking for. Further complaints show that it uses up too much data and that the news sources it has contracted are incredibly limited in scope. Thus, Twitter still remains a better source for quick news as virtually every major network/source has its own page with real-time updates. Furthermore, the app attempts to take on Apple News, which is already directly integrated with every new iPhone model. Trying to adopt a following amid heavy competition is a challenge all its own. The app is currently not available for Android devices, which limits its user base. And who knows, maybe the app would have more success on that platform as Apple News isn’t present there. Furthermore, users are currently complaining about location services and continual prompts on Apple devices, so a bug fix could certainly tune the product. We currently do not have any figures on how many downloads the app has received and likely won’t until the Q4 earnings call. The development costs could be better spent speeding up the perfection process for the WhatsApp and Messenger platforms. 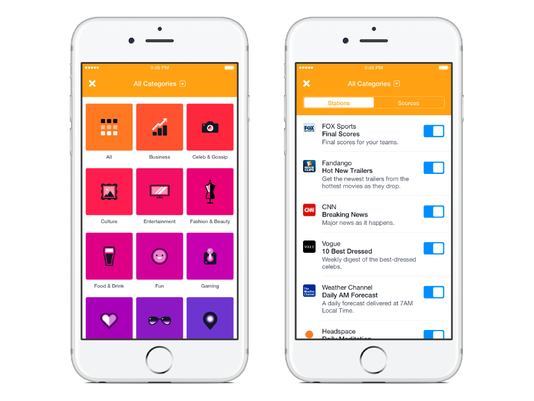 Notify could likely turn into another scenario where shareholders are disappointed that an app isn’t monetized. We’re really seeing Facebook having a hard time gaining a clear trend line and breaking the $107.50 level since the Q3 earnings report. This company is well past its 50 and 200 DMAs, is close to perfectly neutral on the RSI, is seeing lower, more stable volumes, and really has a solid technical basis to pop up. Below you can see the some of the more flat trends and as an added focus take a look at the October to November run up and just how substantial that growth period was. The stagnation post earnings is really what makes me questions this stock’s ability, especially if in a future quarter the company fails to live up to expectations. In terms of other downward catalysts, one could argue that the lack of transparency on their expansion into Africa is concerning (after all, the word “Africa” is only mentioned once on their Q3 10-Q), and that the tech premium that places the stock at a P/E of 106.06 is a target for when the broader market begins to experience a downturn. I will be covering these concerns in Part II. All downside considered, I’m long Facebook because I believe in management, the core product, the growth initiatives in other areas like Oculus, and a continued emphasis on innovation. The above article originally appeared on Seeking Alpha, written by Brandon Dempster. And for investors who want those quick, triple-digit wins, you’ll need to look at small-cap tech stocks. That’s where you’ll find the homerun investments that can make your year with one big win. Those are the kinds of investments that I’m focused on finding. And in my new research advisory, Exponential Tech Investor, I’m introducing readers to companies that have the same growth potential that Amazon had. I have a unique approach for identifying small-capitalization technology companies that make exponential technology (i.e., technologies that transform, or even create, entire industries) the foundation of their products. These are companies that have the potential for triple-digit returns in less than 12 months. And with today’s technologies pushing us toward some truly revolutionary advances, we’re about to see more great investment opportunities than we’ve seen in over 50 years. But separating the winners from the losers is going to be a serious challenge. In a recent presentation, I explain the strategy I’ve been successfully using for decades to find the next Amazons. And you can watch it free here. On Friday, the Labor Department reported that U.S. payrolls rose by 321,000 jobs in November and that hourly wages jumped, easily beating economists’ expectations. This year will be the best for job creation since the boom years of the late 1990s. The Fed says falling prices are bad. They are adding trillions of dollars to the monetary base to make sure the consumer price index rises by its target of 2% a year. But falling oil prices are a good thing. Do we have that right? Sometimes we can’t remember. Let’s see, Americans can spend less on gasoline, leaving them more to spend on other things. Heck, we don’t need no stinkin’ QE anymore. Now we have cheap gas! Wait. Since the crisis of 2008-09 about one-third of capital spending by S&P 500 companies went into energy. And as much as 20% of the high-yield market (junk) now is concentrated in the energy sector. That boom was built on low interest rates and a high oil price. Without cheap money, cheap gas wouldn’t be possible. And when gas gets too cheap, the cheap money suddenly gets very dear. Nearly a trillion dollars of spending worldwide is focused on new energy production. And with oil prices down nearly 40%, much of that spending… and all the subprime energy debt… is in danger. Unless oil prices go back up soon, there could be hell to pay. The Saudis seem to be determined to keep on pumping, despite plunging crude oil prices. The only way they can protect their market share is by remaining the low-cost producer. U.S. frackers are likely to keep fracking too. They’ve bet big money on forcing crude out of grudging rock. They won’t give up easily. Instead, they’ll borrow more heavily to stay in business. But the more they pump… the longer oil prices stay low. Paying $60 to extract a $50 barrel of oil is not a good business – no matter how low interest rates are. Already, the gods have smashed the oil companies, the drillers, the transporters and almost everything else that reeks of gasoline. Soon, they’ll whack at their subprime debt too. Will they bring down other stocks? Bonds? The economy? Only a fool would pretend to know. As to twerking, your editor hasn’t made up his mind. But as to the Fed and its meddling in the markets, he is sure: Less is more. Trying to manage an economy is like trying to manage the love life of a teenage daughter, it’s just going to make things worse. Nintendo NX Scheduled For Mass Production In 2016, Possible Holiday Launch? Nintendo’s newest games console, code-named NX, looks set to enter mass production in Q1 of 2016, according to reports. Foxconn Electronics (Hon Hai), along with other upstream suppliers, expect to achieve 10-12M unit shipments, as opposed to Nintendo’s highly optimistic goal of 20M units. With Tatsumi Kimishima’s recent comments about how NX is the next big leap and the “core focus of our business”, it seems all eyes will be on Nintendo to deliver. Earlier this year, when Nintendo (OTCPK:NTDOY) began quietly releasing dev kits for the new Nintendo NX console, rumors swirled about a possible 2016 launch. It seems that now that theory has been proven valid as, according to electronics supply-side publication Digitimes, major suppliers such as Foxconn (OTC:FXCOF), Macronix, and Coxon Precise Industrial have verified not only that mass production for the Nintendo console will begin in 2016, but that Nintendo’s internal targets are 20M unit shipments for 2016 despite suppliers expecting only 12M at best. While a recent enlightening interview with President Tatsumi Kimishima for TIME magazine clarifies quite a few shareholder concerns and paints a positive outlook for Nintendo’s future, it would be negligent not to examine how Nintendo’s vision for the NX is truly shaping up. First of all, there should be some cause for concern regarding the claim that Nintendo is preparing for such a large and successful release, and this is coming from a Nintendo bull such as myself. It seems the company is now putting all of its chips on the table, so to speak, in investing so much monetary and human capital into Project NX. Judging from competitive and historical context, Nintendo’s targets seem highly ambitious and virtually unfeasible considering component suppliers have even stated they would not be able to meet Nintendo’s expected demand figures. In its first year of sales, Playstation 4 only surpassed 4.2M units, which is significant considering it is the most popular current-gen console on the market. 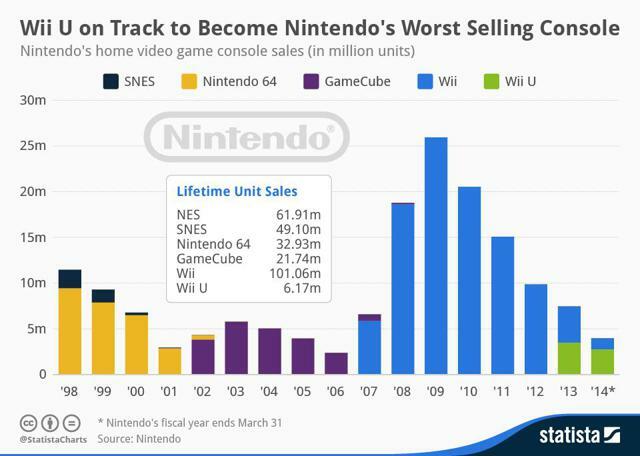 Nintendo’s own massively popular Wii only sold 6.2M units in its first year, 2006-07, albeit the Wii did suffer from supply shortages. Perhaps the company could be preparing for such a similar situation, however, regardless of Nintendo’s ambitions, misplaced or not, suppliers have stated that the target of 20M initial shipments is just not feasible. There is now ample evidence that Nintendo is gearing up for a console launchin holiday 2016, i.e. Q4 2016. Virtually all of Nintendo’s first party developer branches have been closemouthed about any announcements as of late. Additionally, Texas-based Retro Studios, the studio behind Nintendo’s popular Metroid Prime series, along with other third-party developers have gone conspicuously silent on any Nintendo-related projects, suggesting that projects are underway what with the dev kits that Nintendo released back in October. Xenoblade Chronicles developer Monolith Soft also recently announced an“urgent mass recruitment” drive for artists and programmers, possibly in expectation of high levels of future demand. It seems Nintendo is trying to mirror the launch of the Wii, i.e. a holiday launch, high demand, pre-saturated third-party games market, etc. in direct contrast to the failed launch of the Wii U. It remains to be seen how the NX will perform on the marketplace, especially with tough competition from Microsoft (NASDAQ:MSFT) and Sony (NYSE:SNE). 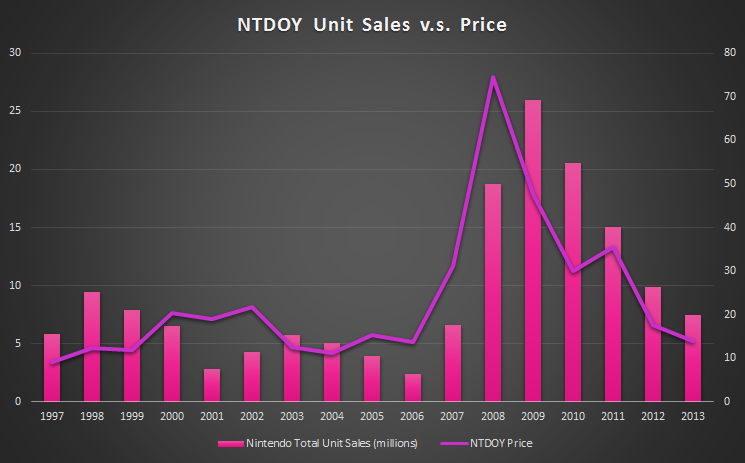 Regardless, NTDOY seems to be in a prolonged bearish phase right now, and if you’re willing to bet on the success of the NX, the stock is relatively undervalued at $19.27 considering its expected earnings from the sales of its current generation products. Judging from technical analysis (Ichimoku strategy) however, it may be best to wait for a cheaper price as this sell-off has yet to subside.